Longboard trucks dictate your cruising style, and you can catch that dream ride by matching the perfect truck for your longboard. Cruising on your longboard around the city or on mild downhill terrains can be the best and most fun activity you can experience. Your choice of trucks will greatly depend on your personal preference. However, there is a particular longboard truck out there that would perfectly match your style. Read on and find that sweet spot you’ve been craving for. Cruiser trucks give you the right amount of control for mild cruising around the block, to your favorite store, cafe, or even to your school. Width is the most crucial factor in a cruiser truck. There are two widths you can choose from – 150mm and 180mm. It is important to match the width of your trucks to the width of your longboard deck before taking into consideration any other options. 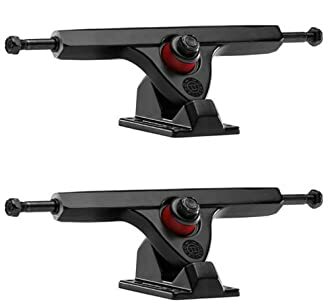 If your deck is narrower than 8.5″, always go for the 150mm trucks. Anything above 8.5″ will perfectly match with the 180mm. Now that you’ve chosen the right width for your ride, you may want to consider also the position of the kingpin as it plays an important role when it comes to controlling your longboard. Most riders prefer the reverse kingpin for better control on boardwalks. Standard kingpin, like those found of skateboards, gives you exact response when using the kicktail. A solid set of trucks that can withstand all weather conditions. Mud, rain, and sand will not stop these from performing its best. Paint finish is likewise resistant to harsh conditions keeping its cool aesthetics longer. Bushings may not be for the super hard skaters, but it does keep up with mild to occasional hard carving. This set is ideal for both cruising and the occasional spur-of-the-moment gentle downhill ride. 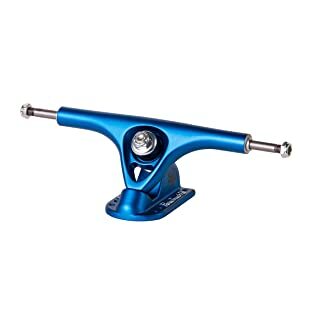 Designed by skaters, the Randall R-11 is a capable, all-around truck that gives better turning control and stability during cruising. It does not wobble even at speeds of up to 35 kph. The stock bushings provide an excellent response during pumping and sharp turns. They are adjustable in a wide range of settings, from ultra-stiff to very soft. Quite versatile that gives a big plus for any trucks. The Paris 50 is best for freeriding when you want a better response and superb control improvement from stock trucks. Easy to adjust and can take the occasional bomb runs, it has a minimal wobble at speeds greater than 30 kph. Some find the bushing seat inferior in quality, but overall, it is a perfect upgrade for your money. 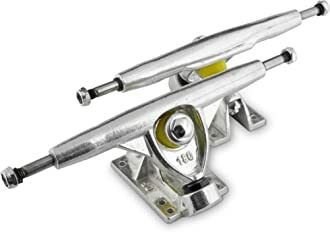 This skateboard truck is the fifth incarnation of the longboard truck of Bear Grizzly that focused on improvements in weight reduction, stronger threaded axel, and less restrictive bushing. It also features an eight-hole mounting baseplate that can be used on both old and new longboards. Stock bushings are pretty decent and are perfect for cruising out of the box. The aesthetics slapped on this one is an eye candy but paints chip off when not packaged correctly. There is still a noticeable restriction on the bushing which is actually useful in avoiding wheel-bite. How many degrees do these trucks sport? It sits 50 degrees on the baseplate. Do they come with mounting screws? No. The only time hardware is packaged with trucks is when the manufacturer or Web store specifies them to be added. I’m in need of a 10-inch axel. What is the axel measurement on these? The Randall 180 axle has a length of 9.5 inches. These specifications may not be enough for your requirement, but they are good quality trucks, with a lifetime warranty, and made in the USA. Keep in mind that your choice of wheels be it a center set or offset design, will greatly impact the overall width of your truck/wheel combo. Will the lifetime warranty be void if I paint my trucks? Lifetime warranty is guaranteed. Painting the trucks will not void it. If you don’t ride in the rain, these trucks will last a lifetime. 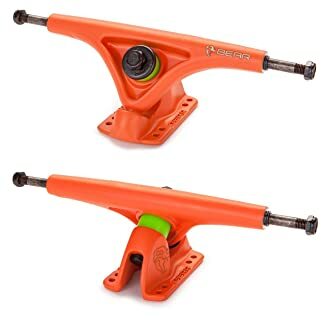 I have a 59mm/78a wheel, will they fit in these trucks? Are the trucks made from metal? Yes, these trucks are manufactured using quality metals. What longboard hardware size should I use or what size fits them perfectly? One and a quarter inch screws will do the trick. Does my purchase include one truck or two? They are sold in pairs so that a purchase will include two pieces of trucks, much like when you’re buying a pair of shoes. Are hardware and riser pads included in the package? Hardware and riser pads are sold separately. The 52 in 8.52 represents the angle of the trucks which is 52 degrees. If you would flip the trucks, you will get 44 degrees. Caliber II Fifty Caliber wins the best truck for free riding or cruising in this roundup. Its survival in harsh conditions takes the cake since not all places we cruise on are picture-perfect. You can also count on it for occasional carving when you’re inspired by that challenging terrain ahead. Prizes for these trucks have minimal differences, should boil down to the shipping fees and speed of delivery and dependent on where you buy them from. A simple drop-in installation and you’re ready to go for that upgraded feel on your cruising experience. Solid construction and great paint job give your longboard that confident feel.